We hope you won’t get into an accident or collision in Mesa, but if you do, we will ensure that your Nissan will be as good as the day you drove it of the lot! Today’s cars have become more complex and intricate in terms of construction and of course, repair as well. If you want to make sure that your Nissan will be repaired with OEM parts in a collision repair shop in Mesa that knows what needs to be done, you should drop your vehicle off at one of the convenient Mesa locations of Excel Collision and Glass Centers. If you have been in a collision in Mesa, you might be tempted to take your Nissan to the cheapest repair shop you can find. But stop a moment and ask yourself if you are willing to sacrifice quality parts and service for the sake of saving a few dollars! We proudly display the I CAR Gold Class Symbol, which is internationally recognized. Today’s vehicles are often constructed with new and innovative materials such as carbon fiber and aluminum. You need to choose a Mesa collision center that knows that aluminum is a highly corruptible metal and needs to be worked on in secluded areas, called clean rooms. That is the only way, your body repair technician can ensure the integrity of your vehicle’s components after a collision. Do not compromise the safety of your Nissan, in order to save some money (which often does not apply anyhow, as your insurance just charges you a flat deductible), or believe your car insurance when they claim they have picked, the best shop for your Nissan already. Mesa drivers are not required to comply with their insurance’s selection and are free to have their Nissan repaired at a body repair shop of their choosing. Excel Collision and Glass Centers is a Mesa Nissan certified repair shop, and we guarantee that our technicians partake in ongoing training and certification courses, but that our shop has OEM parts and the equipment as required by the manufacturer. In order to be considered by Nissan to become a certified collision, you have to follow stringent guidelines and invest in expensive repair equipment, that can easily exceed a quarter of a million Dollars. Not every car dealership is able to fund this kind of endeavor, which makes us only more proud to be able to offer services that others can’t. 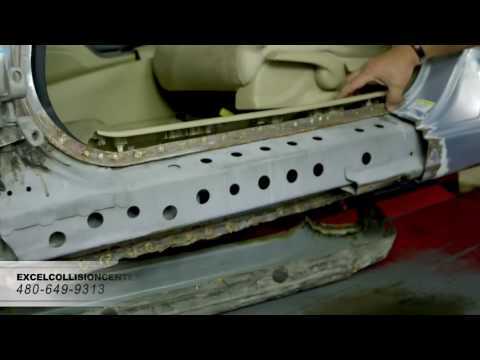 Click here learn more about Nissan’s collision repair philosophy. Excel Collision Centers, as a professional collision repair company, is focused on customer service and repairing any damage your vehicle may have. We have convenient locations in Mesa for you to drop off your Nissan car and receive a thorough damage inspection from our experienced mechanics. With affordable prices and high-quality original manufacturer parts, we are the best collision repair company in Mesa. Excel Collision Centers has been certified by Nissan to perform repairs on all Nissan vehicles, due to our skilled auto body technicians, who show time and again why Excel Collision is one of the best body shops in the Mesa area. Excel Collision Center’s owner, Tim Stone, understands how important your Nissan vehicle is, and that is the reason why he put together a team of mechanics that have the determination, passion, and commitment to skillfully repair your Nissan car and bring it back to a pre-accident condition. Our mechanics have the training and knowledge required to work on any model from Nissan since we certified by them and have the perfect parts to restore your vehicle. Having an affordable Nissan dent removal and repair with a finish like an original manufacturer is what make us the best option in Mesa. Our skilled mechanics are capable of completing your dent repair in hours instead of days like it normally would, compared to the competition. Our customers are always amazed at the results we provide in our dent removal and repair operations. We can work with any dents, dings and scratches your Nissan car may have. Excel Collision is also a certified Nissan auto body repair shop in Apache Junction! Nissan prides itself in creating safe vehicles, so don’t compromise this safety with questionable aftermarket parts. We and Nissan are so convinced of our approach that we warranty our collision repair work for as long as you own your Nissan. We hope you won’t get into an accident or collision in Mesa, but if you do, we will ensure that your Nissan will be as good as the day you drove it of the lot. For more information about our certified Nissan auto body shop in Mesa, Arizona, call our team of professional collision repair experts today at 480-649-9313 and see how we can help, or fill out the form below to learn more.